This 46-piece, 10-unit ANSI compliant kit holds all 8 ANSI required items in a sturdy metal case with gasket. 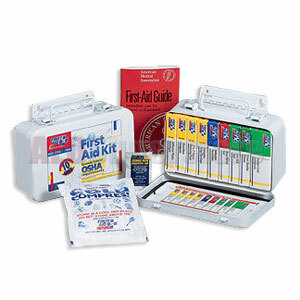 The kit also includes a 4" x 5" cold compress and First Aid Guide. Meets ANSI Z308.1-2009 requirements.